The 2007 Dodge Dealers 400 was the twenty-eighth stock car race of the 2007 NASCAR Nextel Cup Series and the second in the ten-race season-ending Chase for the Nextel Cup. It was held on September 23, 2007 at Dover International Speedway in Dover, Delaware before a crowd of 137,000. The 400-lap race was won by Roush Fenway Racing driver Carl Edwards who started from fifteenth position. His teammate Greg Biffle finished second and Dale Earnhardt Jr. came in third. Although Jimmie Johnson won the pole position by posting the fastest lap in qualifying, he was passed by Denny Hamlin on the second lap. Hamlin led for the next 40 laps until Matt Kenseth passed him. Hamlin retook it on the 57th lap and Kurt Busch led from laps 85 to 98 after a pit stop cycle. Kenseth returned to the lead on lap 99, and kept the position for a race-high 169 laps. On lap 207, Edwards took the lead for the first time, and maintained it until Mark Martin overtook him 21 laps later. Edwards would not reclaim the first place until he moved past his teammate Kenseth in the final-third of the race and kept it until Kenseth led six laps before his engine failed. This enabled Edwards to return to the lead which he held through two red flag periods to clear debris and fluids after two separate accidents to win the race. There were thirteen cautions and fourteen lead changes by nine drivers during the course of the race. Edwards' victory was his third of the season, the seventh of his career, and the 100th for Roush Fenway Racing. However, Edwards was issued a 25 points penalty after the right-rear of his vehicle was found to be too low in post-race inspection, and it was upheld in a subsequent appeal to the National Stock Car Racing Commission. After the race Jeff Gordon became the new leader of the Drivers' Championship with Tony Stewart advancing to second and Johnson dropping to third. In the Manufactuers' Championship Chevrolet maintained the lead with a 57-point lead over Ford with Dodge and Toyota retaining third and fourth with eight races left in the season. Dover International Speedway, where the race was held. The Dodge Dealers 400 was the 28th of 36 scheduled stock car races of the 2007 NASCAR Nextel Cup Seriesand the second in the ten-race season-ending Chase for the Nextel Cup. It was held on September 23, 2007 at Dover International Speedway in Dover, Delaware, one of five short tracks to hold NASCAR races; the others are Bristol Motor Speedway, Richmond International Raceway, Martinsville Speedway, and Phoenix International Raceway. NASCAR makes use of the track's standard configuration, a four-turn 1 mile (1.6 km) short track oval. The track's turns are banked at twenty-four degrees, and both the front stretch (the location of the finish line) and the backstretch are banked at nine degrees. Before the race, Jimmie Johnson and teammate Jeff Gordon were tied for the lead in the Drivers' Championship on 5,210 points, with Tony Stewart in third. Clint Bowyer and Kyle Busch were fourth and fifth, and Martin Truex, Jr., Matt Kenseth, Carl Edwards, Denny Hamlin, Kevin Harvick, Jeff Burton and Kurt Busch rounded out the top twelve drivers competing for the 2007 Chase for the Nextel Cup. Chevrolet led the Manufactuers' Championship with 215 points; Ford was second with 153 points. Dodge was third with 139 points, and Toyota a further 54 behind in fourth. Burton was the race's defending champion. Former V8 Supercars champion and Busch Series driver Marcos Ambrose was scheduled to drive for Robby Gordon Motorsports after team owner Robby Gordon offered him the seat to make up for an incident between the two in the NAPA Auto Parts 200 Busch Series race at Circuit Gilles Villeneuve. However, Ambrose withdrew from the race as his wife Sonja was due to give birth to their second child intermittently. Three part-time season drivers attempted to qualify for the Dover International Speedway round: Sam Hornish Jr. for Penske Racing South, Scott Wimmer in the No. 33 Richard Childress Racing vehicle, and Kenny Wallace who filled in for the injured Ricky Rudd in the No. 88 Robert Yates Racing car. Three practice sessions were held before the Sunday race: one on Friday and two on Saturday. The first session lasted 90 minutes, the second 50 minutes and the third 60 minutes. In the first practice session, Johnson was fastest with a lap time of 23.423 seconds. Hamlin was 0.071 seconds slower in second, and Tony Raines was third. Martin Truex Jr. was fourth fastest; Juan Pablo Montoya was fifth, and Bobby Labonte sixth. Dale Earnhardt Jr. placed seventh, David Ragan eighth, Scott Riggs ninth, and Gordon tenth. On his first lap on the track, the engine in A. J. Allmendinger's car failed, and his team changed engines. Jimmie Johnson took his second pole position of the season and his first at Dover International Raceway. Although 49 cars were entered for qualifying, according to NASCAR's qualifying procedure, only 43 could race. Each driver was limited to two timed laps, with the starting order determined by the competitor's fastest times. Johnson clinched his second pole position of the season, and his first at Dover International Raceway, with the fastest time of 23.261 seconds. He was joined on the grid's front row by Montoya, the highest-placed rookie, who was 0.141 seconds slower, and had the pole position until Johnson's lap. Hamlin qualified third, Kurt Busch took fourth after improving his car's handling, and the Autism Speaks 400 winner Truex started from fifth. Riggs was the fastest of those drivers who were required to qualify for the race on time in sixth. Rounding out the top ten were Harvick, Labonte, and the Roush Fenway Racing duo of Greg Biffle and Kenseth. Edwards, another driver in the chase, set the 15th-fastest time, while the winner of the preceding Sylvania 300, Bowyer struggled on his lap en route to 42nd. The six drivers who failed to qualify were Ward Burton, Wimmer, Kevin Lepage, Dave Blaney, Jeremy Mayfield and Hornish. After the qualifier, Johnson said, "It was a great lap. I've had a great car all day today and it was a car that allowed me to balance myself and find more speed, the two things that I asked it to do. Track position is really important here but the thing we really focused on today was getting that first pit stall. So mission accomplished there, but this is just one day of many long ones to come." On Saturday morning Hamiln became ill with flu-like symptoms, but he was still fastest in the second practice session with a time of 23.849 seconds. Second place went to Johnson and third position was taken by Stewart. Kurt Busch duplicated his qualifying result in fourth. Casey Mears set the fifth-quickest time, and Mark Martin was sixth. Positions seven through ten were occupied by Biffle, Gordon, Kenseth and Burton. Of the other drivers in the chase, Kyle Busch was thirteenth, and Edwards recorded the eighteenth-fastest lap. Later that day, Hamlin continued his strong form by pacing the final practice session with a 23.946 seconds lap; Kenseth and his teammate Edwards set the second and third-fastest lap times. Johnson was fourth-fastest, ahead of Bowyer and Gordon. Jamie McMurray, Martin, Truex and Earnhardt completed the top ten ahead of Sunday's race. Live television coverage of the race began at 1:00 p.m. Eastern Daylight Time in the United States on ABC. Around the start of the race, weather conditions were sunny and clear with the air temperature at 79 °F (26 °C); a ten percent chance of rain was forecast. Dan Schafer, Pastor of Calvary Assembly of God in Hightstown, New Jersey, began pre-race ceremonies with an invocation. America's Got Talent finalist Julienne Irwin performed the national anthem, and Chrysler chairman and chief executive officer Robert Nardelli commanded the drivers to start their engines. During the pace laps, Allmendinger moved to the rear of the grid because he changed engines. The race began at 1:47 p.m. Johnson maintained by the lead by turning onto the inside of the track, as Hamlin passed Montoya for second place. On the second lap, Hamlin made contact with Johnson which got the latter loose, and he became the new leader. Montoya ran on the top groove and fell from second to tenth in the first ten laps. The first caution was given on lap 12. David Gilliland tagged the rear of Johnny Sauter's car leaving turn four, sending Sauter into the inside wall on the front stretch, causing heavy damage to his vehicle. Hamlin stayed as the leader at the lap-17 restart. Four laps later, the second caution was necessitated when Ken Schrader spun 360 degrees on the back straightaway after Reed Sorenson bumped him on the exit of turn four. Schrader's car sustained minor damage and he drove to pit road for repairs. Racing resumed on the 24th lap with Hamlin leading Johnson and Kenseth. On lap 27, Johnson lost second place to Kenseth who turned onto the bottom lane. After starting 21st, Earnahrdt was running in ninth by lap 35. Ten laps later, Hamlin was passed for the first position by Kenseth. Gordon moved to eighth after making a pit stop under caution. Matt Kenseth (pictured in 2009) led a race-high 192 laps and was constantly in the top ten before his engine failed on lap 364 . On lap 54, the third caution was waved for debris on the track. All of the leaders made pit stops for fuel and car adjustments. Michael Waltrip led one lap under caution, before returning it to Hamlin after a pit stop. Hamlin held it at the restart on lap 59. Johnson fell to ninth behind his teammate Gordon as a consequence of the pit stop cycle. Kenseth drew alongside Hamlin and the two began duelling for the lead. Just as they were doing so, a fourth caution came out for Kyle Petty who was spun by Schrader in the middle of turn two. Petty avoided contact with the wall alongside the track. The leaders, including Hamlin, elected to make pit stops for fuel and tyres during the caution. A tire from Dale Jarrett's pit stall rolled onto the fast lane of pit road, and several cars avoided striking it. Ragan could not do so as the tire rolled in front of his car and he hit it. The tire went airborne into Waltrip's pit stall, and struck the helmet of gas man Art Harris, causing him to fall to the ground. Harris received medical attention and was transported via ambulance to the infield care center. Kurt Busch won the race off pit road, and led the field back up to speed at the restart on lap 85. Kenseth moved into third six laps later, as Hamlin was battling Mears for fifth. On lap 98, Edwards fell to third when Kenseth overtook him. Kenseth went to the outside lane to pass Kurt Busch for the lead on the 99th lap. Edwards got ahead of Kurt Busch (who was on worn tires because he did not make a pit stop) to move into second position on lap 122. 26 laps later, the fifth caution was waved to allow Harris to be transported via ambulance to a local hospital by opening a trackside gate since no underground tunnels were available. The leaders took the opportunity to make pit stops for fuel and tires. Edwards' team rectified a throttle leakage problem by opening the hood of his car. The race restarted on lap 153 with Kenseth leading Earnhardt and Biffle. Earnhardt dropped to fourth on lap 152 when he got loose, and allowed Kurt Busch and Biffle to pass him. 16 laps later, Biffle passed Kurt Busch for second place. Johnson's rear-right tire shredded on lap 188, glancing the back stretch wall on his way to pit road, where his team changed all four tires. On lap 204, the sixth caution was prompted when Hamlin hit Petty leaving the fourth turn, sending Petty into the front stretch wall after he spun. Bowyer also ran into Hamlin and damaged the bracket holding his right-front splitter in place. Hamlin had heavy damage to the right-hand side of his car, while the damage to Petty's car was heavy enough to warrant his retirement from the race. The leaders went to pit road to change tires and make car adjustments. Hamlin tried to get back up to speed on the track, but was prevented from doing so because of a broken brake rotor, causing him to return to pit road with no braking. Kenseth led at the lap-212 restart. The seventh caution was promoted 17 laps later as McMurray and Montoya collided on the back stretch. McMurray's right-rear tire was cut from the contact, and he slid up to the wall, before returning to his garage. Some leaders elected to make pit stops for fuel, tires and car adjustments. Kenseth kept the lead at the restart on lap 236. By lap 244, Edwards overtook Ryan Newman and Kurt Busch to get into second. Martin moved to third on the 253rd lap. Kenseth drove up the track fifteen laps later, and Edwards got underneath him for the lead. Martin moved ahead of Kenseth to take over second on lap 272. Martin caught Edwards by lap 282, and took the lead when Edwards made his first green flag pit stop for four tires and a car adjustment. The first eight drivers were on an alternative pit stop cycle, meaning they remained on track to try and reach the end of the race on one more pit stop. Biffle, Sorenson, and Kenseth all led during this period. After the pit stops, Edwards overtook his teammate Kenseth for the lead on the 322nd lap. 33 laps later, the eighth caution was deployed when debris was spotted on the track. Most drivers, including Edwards, elected to make pit stops for car adjustments under caution. Kenseth led at the lap-361 restart, but lost it to teammate Edwards two laps later as his engine was failing. That lap, the ninth caution came out for John Andretti who lost control of his car, and made contact with Raines on the back stretch after leaving the second turn. Eight laps later, the race was red-flagged for five minutes for on-track debris and fluid clearing. Carl Edwards won his seventh career victory and the 100th for Roush Fenway Racing. The race restarted on lap 364, when a tenth caution was needed for Kenseth whose engine failed. Five laps later, Edwards became the leader, and maintained it at the lap-379 restart. Robby Gordon lost control of his car in the second turn on the 381st lap, and clouted the wall alongside the track, necessitating the eleventh caution. Edwards still led at the restart four laps later. The following lap, a multi-car accident prompted the twelfth caution and later the race's second red flag to clear debris and fluids in turn three. A car component broke on Kurt Busch's car, and he went into the backstretch wall on lap 386. Truex could not avoid Kurt Busch, and drove into his car, which ricocheted into Sorenson. Kahne could not negotiate his way through and crashed. Other drivers involved were J. J. Yeley, Labonte, Jeff Green, Riggs, Johnson, Elliott Sadler, and Newman. Once series officials lifted the red flag conditions twelve minutes later, some cars made pit stops for repairs and tires to enable them to finish the event. Edwards and Martin stayed on the track, and led the field at the restart on lap 390 with Earnhardt and Biffle third and fourth. On the following lap, Biffle got around Earnhardt to take over third place. Lap 393 had the thirteenth (and final) caution come out for a stray piece of sheet medal from Truex's damaged car that cut his right-front tire and fell on the track. Fifth-placed Kyle Busch and Truex went to pit road for repairs, while the rest of the pack stayed on the track. Edwards held the first position on the lap-397 restart with Martin, Biffle, and Earnhardt in second through fourth. On the lap, Biffle overtook Earnhardt to move into second. Edwards maintained the lead over his teammate Biffle for the remaining three laps to secure his third victory of the season and the seventh of his career. It was the 100th victory for Roush Fenway Racing in the NASCAR Cup Series since Martin won the team's first race at the 1989 AC Delco 500. Edwards' teammate Biffle finished second, ahead of Earnhardt in third, Martin in fourth, and Kyle Busch fifth. Mears, Burton, McMurray, Stewart and Montoya rounded out the top-ten finishers. The race had a total of thirteen cautions and fourteen lead changes by nine drivers. Kenseth's total of 192 laps led was the highest of any driver. His teammate Edwards led three times for a total of 92 laps. Edwards appeared in Victory Lane to celebrate his seventh career win in the Nextel Cup Series in front of the crowd of 137,000 spectators; the win earned him US$229,250. Edwards spoke of his enjoyment of the race, "Those red flags were killing me. I wanted to win bad; this is the Chase, we're in this deal and we've been working hard. A lot of guys are having bad luck and I'm sure we'll get our fair share of that as well but to see Matt Kenseth lose an engine is not good. We hope it doesn't happen to us and I'm happy we were able to capitalize today," Biffle was satisfied with his second-place finish but said that he felt he could have challenged his teammate towards the end of the race, "I know he's in the Chase and he had a little cushion [Sunday], and I needed a win pretty bad, but we were going to race him clean, but I wish I had a chance at him. It was a pretty good run for us. We hadn't been running like this all season, so it's nice to be back running decent again." Third-placed Earnhardt called it "an adventurous race" for him and several drivers, "We had a lot of luck on our way but we worked really hard to get to where we got. We got a lap down but we were able to get it back. It was a good run for us. It's going to help us getting into the next couple of races." As Hamlin waited for his car to be repaired by his team on pit road, Petty went to him, pulled down the window net, exchanged angry words, and slapped the visor down on Hamlin's helmet. Petty then walked away. Hamlin took off his helmet and followed Petty. Pit crews and series officials separated the pair to prevent a physical confrontation. Hamlin asserted he did not intentionally crash into Petty, and threatened to assault him the next time round, "You smack me on the helmet and I'm going to punch you in the face, bottom line. So I'd like for him to call me some time this week. You don't come to my car. You don't come to my pit. You meet me somewhere else and we'll settle it. I have the utmost respect for Kyle, but don't lay your hands on my head." Petty accused Hamlin of not being focused after the latter won the previous day's Busch Series race and questioned his driving ability, "He needs to think (about) the whole race, not just part of the race. If he can't think for (400) miles, he needs to start pacing himself. Maybe he used all his good stuff (in his Busch Series win)." Hamlin denied Petty's accusation and said he was more concerned about the Drivers' Championship, "We're in a clutter of leaders and he's racing his own little battle and some days it's your day and some days it's not. Get out of the way." If [Edwards] loses it by a number less than 25 points, it will be another bitter pill. NASCAR, through their punitive actions that have been arguably ill-advised, has affected a number of outcomes in championships for my teams in the last 20 years. It would be one more. Every time they do that ... it takes the edge off the excitement that I have in going to the racetrack and being a part of the show." Jack Roush on the possible implications the penalty imposed on Carl Edwards would have on the Drivers' Championship. Edwards' car failed post-race inspection because its right-rear was found to be too low by three-eighths of an inch less than the minimum amount allowed by NASCAR. Although NASCAR determined that no malice was committed, they transported Edwards' car to their Research and Development Center in Concord, North Carolina for further analysis. Team owner Jack Roush stated the car was not altered in any form and spoke of his belief that a dent caused the rule violation. Edwards suspected a congratulatory bump from his teammate Biffle caused the car's failed inspection. Two days after the race, Roush Fenway Racing was given penalties for "actions detrimental to stock car racing", "car, car parts, components and/or equipment not conforming to NASCAR rules" and for the rear of Edwards' car failing to meet the Car of Tomorrow ride height regulations. The penalties included a $25,000 for crew chief Bob Osborne who was placed on probation until December 31, 2007. Edwards and car owner Jack Roush incurred the loss of 25 driver and owner points. Roush Fenway Racing president Geoff Smith stated the team saw no logic to the penalty, which they felt was not fair, and announced their decision to appeal. The penalty attracted criticism from Damian Dottmore of Orange County Register who argued Edwards should have been allowed to keep all the points he scored at Dover and be forced to start from the rear of the grid, citing an earlier case from the Daytona 500 in February when Gordon was penalized for his car violating series regulations. However, The Denver Post's Mike Chambers argued that the penalty should remain consistent in all races after quoting Roush Fenway Racing's opinion on having no more than ten points deducted from a driver in the chase who has been penalized. The appeal was heard before a three-member National Stock Car Racing Commission on October 9. All three unanimously upheld NASCAR's original penalty. Afterward, Edwards said he was pleased to have his viewpoint heard, but then called for an arbitrator to preside over the case, "I was impressed with the guys who came and heard our side of it. They’re all volunteers. It was awesome that they did that. But they are all really appointed by NASCAR, I guess. If I could have brought three or four of my friends to hear it, I’m sure it would have been different.” The final result of the appeal dropped Edwards from third to sixth in the Drivers' Championship. The result of the race advanced Gordon to the lead of the Drivers' Championship with 5,340 points. His nearest rival became Stewart who had two less points in second, and Johnson fell to third. Kyle Busch moved into fourth, while Bowyer's performance dropped him to fifth. Edwards, Truex, Burton, Harvick, Kenseth, Kurt Busch and Hamlin rounded out the top twelve. In the Manufacturers' Championship, Chevrolet maintained the lead with 219 points. Ford remained in second with 162 points, ahead of Dodge in third with 143 points, and fourth-placed Toyota with 89 points. The race took three hours, 55 minutes and 39 seconds to complete, and the margin of victory was 0.617 seconds. 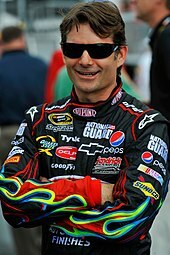 Jeff Gordon (pictured in 2009) became the new points leader after the race. Note: Only the top twelve positions are included for the driver standings. These drivers qualified for the Chase for the Nextel Cup. ^ a b c d e f g h i j k l m n o p q "The Race: The Dodge Dealers 400". Jayski's Silly Season Site. ESPN Internet Ventures. Archived from the original on October 12, 2007. Retrieved April 4, 2016. ^ a b c d e f g "2007 Dodge Dealers 400". Racing-Reference. USA Today Sports Media Group. Retrieved April 4, 2016. ^ "2007 Dodge Dealers 400 weather information". Old Farmer's Almanac. Yankee Publishing. Archived from the original on February 22, 2014. Retrieved June 6, 2013. ^ "2007 NASCAR Sprint Cup TV Ratings". Jayski's Silly Season Site. ESPN Internet Ventures. Archived from the original on August 29, 2008. Retrieved December 27, 2014. ^ "NASCAR Race Tracks". NASCAR. Turner Sports Interactive, Inc. Archived from the original on September 12, 2010. Retrieved September 23, 2010. ^ a b Culver, Chad (2014). Dover International Speedway: The Monster Mile. Mount Pleasant, South Carolina: Arcadia Publishing. p. 9. ISBN 978-1-4671-2137-8. Archived from the original on August 10, 2018. Retrieved August 10, 2018. 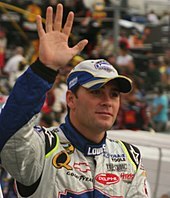 ^ "2007 Official Driver Standings: Sylvania 300". NASCAR. Turner Sports Interactive, Inc. Archived from the original on September 16, 2009. Retrieved April 4, 2016. ^ a b c "2007 Manufacturers' Championship Standings". Jayski's Silly Season Site. ESPN Internet Ventures. Archived from the original on May 11, 2008. Retrieved November 25, 2015. ^ Ottley, Stephen (September 18, 2007). "Marcos Ambrose takes Nextel Cup raincheck". Herald Sun. Archived from the original on October 14, 2007. Retrieved August 9, 2018. ^ "Hornish Highlights – September 17, 2007" (Press release). Penske Racing South. September 19, 2007. Archived from the original on October 12, 2007. Retrieved August 9, 2018. ^ "Kenny Wallace back in the #88 at Dover" (Press release). KennyWallace.com. September 17, 2007. Archived from the original on October 11, 2007. Retrieved August 29, 2018. ^ "Practice #1 – Dover International Speedway: 2007 Dodge Dealers 400". Fantasy Racing Cheat Sheet. September 23, 2007. Archived from the original on October 31, 2013. Retrieved August 9, 2018. ^ Rabun, Mike (September 21, 2007). "Jimmie Johnson wins NASCAR pole". United Press International. Retrieved August 9, 2018 – via Biography in Context. ^ a b c d Meija, Diego (September 21, 2007). "Johnson scores Dover Cup pole". Autosport. Haymarket Publications. Archived from the original on August 10, 2018. Retrieved August 9, 2018. ^ a b "Points leader Johnson takes pole at Dover qualifying". ESPN. ESPN Internet Ventures. Associated Press. September 22, 2007. Archived from the original on August 10, 2018. Retrieved August 9, 2018. ^ a b Swan, Raygan (September 22, 2007). "Notebook: Hamlin feeling ill but dominant in practice". NASCAR. Turner Sports Interactive. Archived from the original on October 1, 2007. Retrieved August 9, 2018. ^ "Early riser Hamlin leads practice two". crash.net. Crash Media Group. October 23, 2007. Archived from the original on August 9, 2018. Retrieved August 9, 2018. ^ a b c d e "Lap-by-Lap: Dover". NASCAR. Turner Sports Interactive. September 23, 2007. p. 5. Archived from the original on June 28, 2011. Retrieved August 9, 2018. ^ a b c d e "Lap-by-Lap: Dover". NASCAR. Turner Sports Interactive. September 23, 2007. p. 4. Archived from the original on October 14, 2012. Retrieved August 9, 2018. ^ a b c d e f g "Lap-by-Lap: Dover". NASCAR. Turner Sports Interactive. September 23, 2007. p. 3. Archived from the original on October 14, 2012. Retrieved August 9, 2018. ^ a b c "Lap-by-Lap: Dover". NASCAR. Turner Sports Interactive. September 23, 2007. p. 2. Archived from the original on October 14, 2012. Retrieved August 9, 2018. ^ a b c d "Lap-by-Lap: Dover". NASCAR. Turner Sports Interactive. September 23, 2007. p. 1. Archived from the original on October 14, 2012. Retrieved August 9, 2018. ^ "Edwards picks up pace in Chase". Calgary Herald. September 24, 2007. p. C1. Archived from the original on August 10, 2018. Retrieved August 10, 2018 – via PressReader. ^ Gelston, Dan (September 24, 2007). "Edwards avoids trouble, tames Monster". The Herald. p. 3B. Archived from the original on August 10, 2018. Retrieved August 10, 2018. ^ Felix, Ron (September 24, 2007). ""Concrete" Carl Edwards Wins At Dover". Insider Racing News. Archived from the original on August 10, 2018. Retrieved August 10, 2018. ^ a b Meija, Diego (September 24, 2007). "Edwards wins Dover Cup carnage". Autosport. Haymarket Publications. Archived from the original on August 10, 2018. Retrieved August 10, 2018. ^ Aumann, Mark (September 24, 2007). "Biffle comes up short, but pleased amid rough year". NASCAR. Turner Sports Interactive. Archived from the original on October 15, 2007. Retrieved August 9, 2018. ^ a b Graves, Gary; Perez, A. J. (September 24, 2007). "Hamlin, Petty have midrace confrontation". USA Today. p. 14C. Retrieved August 9, 2018 – via Biography in Context. ^ a b c Gelston, Dan (September 23, 2007). "Angry Petty lays the smack down in garage on Hamlin". The Pantagraph. Associated Press. Archived from the original on August 10, 2018. Retrieved August 10, 2018. ^ Caraviello, David (September 28, 2007). "Edwards' penalty leaves Roush with familiar feeling". NASCAR. Archived from the original on October 11, 2007. Retrieved August 9, 2018. ^ a b Long, Dustin (September 25, 2007). "Roush calls penalty unreasonable". News & Record. Archived from the original on August 9, 2018. Retrieved August 9, 2018. ^ a b Dottore, Damian (September 25, 2007). "NASCAR's penalty too stiff for Edwards?". Orange County Register. Archived from the original on August 9, 2018. Retrieved August 9, 2018. ^ Fryer, Jenna (September 26, 2007). "Edwards docked 25 points for failing inspection, drops to sixth in the standings". Pocono Record. Associated Press. Archived from the original on August 11, 2018. Retrieved August 10, 2018. ^ a b c Chambers, Mike (September 25, 2007). "Take penalty and sit down". The Denver Post. Archived from the original on August 9, 2018. Retrieved August 9, 2018. ^ Demmons, Doug (September 25, 2007). "Carl Edwards docked 25 points, crew chief fined". The Birmingham News. Archived from the original on November 20, 2012. Retrieved August 9, 2018. ^ a b Fryer, Jenna (October 11, 2007). "After points loss is reaffirmed, Edwards is impressed with hearing, but not with NASCAR's appeals process". The Modesto Bee. Associated Press. Archived from the original on August 9, 2018. Retrieved August 9, 2018. ^ a b "2007 Official Driver Standings: Dodge Dealers 400". NASCAR. Turner Sports Interactive. Archived from the original on June 8, 2009. Retrieved August 10, 2018. ^ "Race Lineup". NASCAR. Turner Sports Interactive. Archived from the original on October 6, 2007. Retrieved August 10, 2018.